My work attempts to establish control over the unknown by adopting a machine-like process to the human act of mark-making. I strive to paint, perfectly and repeatedly, complex halftone patterns that I generate from my photographs. Traditionally used as a means for rapid and inexpensive image reproduction in the publishing industry, I take these methods and subvert their original purpose. A tense dialogue between man and machine emerges; the human hand fails to replicate the exact workings of the machine and the paintings become something new altogethersomething unimaginable by the machine. 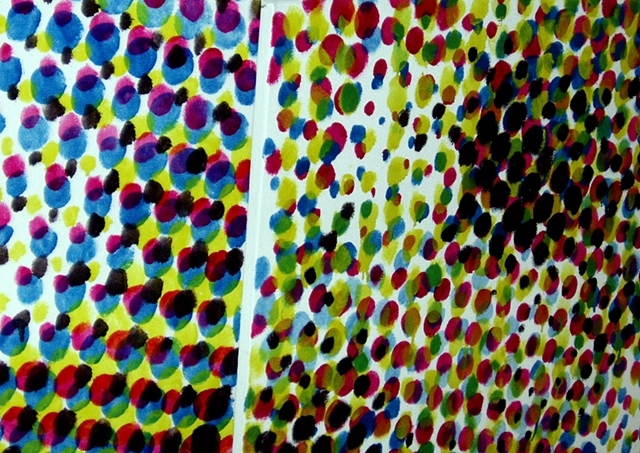 Written in drips, mistakes and imperfect circles, th¬is strict process yields a new motif, a new overall image. These ideas originated while studying at the Bauhaus University, in Weimar Germany. I continue to be fascinated by the mechanical means of image construction and deconstruction, particularly through photographic processes.